This never-before-translated masterpiece—by a heroic best-selling writer who saw his life crumble when he wouldn’t join the Nazi Party—is based on a true story. "The greatest book ever written about German resistance to the Nazis." 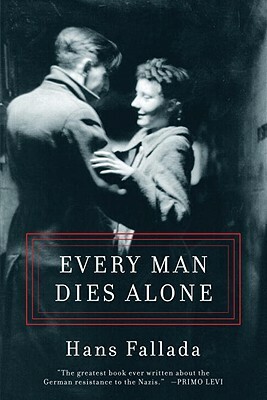 "Hans Fallada's Every Man Dies Alone is one of the most extraordinary and compelling novels ever written about World War II. Ever. Fallada lived through the Nazi hell, so every word rings true–this is who they really were: the Gestapo monsters, the petty informers, the few who dared to resist. Please, do not miss this." "A signal literary event of 2009 has occurred. Rescued from the grave, from decades of forgetting, [Every Man Dies Alone] testifies to the lasting value of an intact, if battered, conscience. In a publishing hat trick, Melville House allows English-language readers to sample Fallada's vetiginous variety [and] the keen vision of a troubled man in troubled times, with more breadth, detail, and understanding than most other chroniclers of the era have delivered. To read Every Man Dies Alone, Fallada's testament to the darkest years of the 20th century, is to be accompanied by a wise, somber ghost who grips your arm and whispers in your ear: 'This is how it was. This is what happened.'" "Every Man Dies Alone...deserves a place among the 20th century's best novels of political witness." "Every Man Dies Alone [is] a suspense-driven novel...one-of-a-kind." "Every Man Dies Alone [is] one of the most immediate and authentic fictional accounts of life during the long nightmare of Nazi rule." "Primo Levi…called this "the greatest book ever written about the German resistance to the Nazis." It is, in retrospect, an understatement. This is a novel that is so powerful, so intense, that it almost hums with electricity." " [Every Man Dies Alone] has the suspense of a John le Carré novel, and offers a visceral, chilling portrait of the distrust that permeated everyday German life during the war." "[A]t once a riveting page turner and a memorable portrait of wartime Berlin...With its vivid cast of characters and pervasive sense of menace, Every Man Dies Alone is an exciting book."